After suffering a series of post-9/11 attacks by U.S.-led NATO forces, the Taliban's reign of terror and brutality in Afghanistan seemed inactive. But since then, the Taliban has not only re-emerged as a bigger challenge for NATO forces, it has also extended its sphere of influence in Pakistan. Tehrik-i-Taliban, the main Taliban group in Pakistan, is not just a militant organization, it is an ideological movement. Supporting the Taliban does not require that people have rocket launchers strapped to their shoulders or Kalashnikovs in their hands. Taliban ideologues are not only fighters; they work white-collar jobs all over Pakistan. Former President General Parvez Musharraf addressed this when he suspended the Chief Justice of the Supreme Court, Iftikhar Choudhary. General Musharraf stated that the Supreme Court was creating hurdles in the implementation of government decisions—decisions that were necessary to contain terrorism in Pakistan. It was Musharraf who carried out "Operation Sunrise" in 2007 at Lal Masjid (Red Mosque), a complex used to spread Taliban ideology. During that operation the entire world witnessed a confrontation between the security forces of Pakistan and people in religious costumes armed with modern weapons. On paper, Lal Masjid functioned as a madrassa and a charitable organization, but in fact it had become a shelter for terrorists. In the same operation, people also saw the chief of the mosque, Abdul Aziz, try to escape security forces by veiling himself alongside a group of women. Security forces held Aziz, while his brother was killed during the same operation. Now Pakistan has a civilian government. In March, former Prime Minister Nawaz Sharif tried to hit multiple targets with one arrow by organizing the Long March. He demonstrated his political might to President Asif Ali Zardari, built his image in the judiciary of Pakistan, and got Justice Iftikhar Choudhary reinstated along with other judges who were suspended during the Musharraf regime. After this reinstatement, among the judicial verdicts, which are coming out now, was the quashing of the disqualification of Sharif brothers for contesting elections. Another was the release of Abdul Aziz, the chief of Lal Masjid. One might ask how a common, secular person's view of the judiciary might be affected by this decision. The Pakistan army is now fighting the Taliban on the Afghan border, but the protests in many cities of Pakistan against this operation reveal something else. After three decades, the leaderships of both Pakistan and the United States have admitted that the C.I.A. and the I.S.I. (Pakistan's intelligence agency) had a role, albeit indirect, in the creation and strengthening of Taliban. This is evidence in itself that Taliban is not specific to a particular set of people in a single area or occupation. Rather, its presence can be found in religious houses, government offices, courts, political organizations, as well as among the security forces. Recently there were suicide bombings in Lahore and Peshawar in retaliation of army operations against the Taliban in Swat valley. Prior to this, Pakistan faced uncounted terror attacks. While Benazir Bhutto died in such an attack, there were also assassination attempts on Musharraf and Nawaz Sharif. President Zardari and the Prime Minister Yousuf Raza Gilani have also received death threats. Without local support and patronization, such frequent threats and incidents would not be possible. Tehrik-i-Taliban wants to control the whole of Pakistan. For this, it is soliciting support from fundamentalist religious forces. 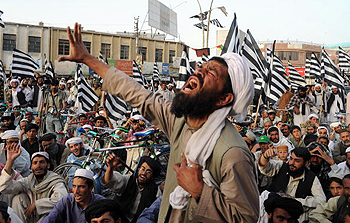 Its long-term goal is to enforce Shariah law, which at one point was enforced in the Swat Valley in a pact with the Pakistan government before being broken down. Pakistan is passing through a critical juncture. Pakistani leadership is presently facing many challenges, ranging from the activities of the Taliban in Afghanistan to Tehrik-i-Taliban and other terrorist organizations active in Pakistan. The danger lies not merely in the training camps and weapons of these networks, but in the "love" for the Taliban among the fundamentalists and extremists in Pakistan. The military effort of the Pakistan army, with U.S. backing, may be able to beat back Taliban forces, but until the Taliban ideology has been eradicated, an end to the battle is nowhere in sight. To make any long-term ground, the Pakistan government and army need to find a way to address the virus that has common, white-collared people promoting the interests of the Taliban. Tanveer Jafri is a columnist based in India.